Founder and chairman of Universal Entertainment Corporation and former executive at Wynn Resorts, Japanese billionaire Kazou Okada has seen his rise to the upper echelons of global casino operators torpedoed by his own children, faced unsubstantiated claims of misuse of company funds and been barred from a property, the Okada Manila casino, bearing his own name. Despite the recent spate of brutal attacks that forced him out as Universal Entertainment chairman, a company he founded, in an attack by Universal executives who Okada claims manipulated his own children to oust him, in an exclusive interview with the Asia Times, Okada says he’s gearing up not only to clear his name but to take it all back. Earlier this year, after many years of wrangling and in the face of public opinion, the government of Japanese Prime Minister Shinzo Abe managed to pass through legislation legalizing casino gambling in Japan. The move, which will allow for the issuance of three integrated casino resort licenses across the country, is part of the prime Minister’s attempts to boost tourism in Japan and stimulate the country’s lacklustre economy. As a result, most of the industry’s major players have lined up to take a shot at the licenses, with MGM Resorts International, Melco Resorts and Entertainment, Caesars Entertainment Corp, Galaxy Entertainment Group, Las Vegas Sands Corp, and Genting Singapore Ltd among others all promising to make massive investments, up to $10 billion in some cases, were they to win the licenses. Morgan Stanley has estimated the casino market in Japan to be worth some $15 billion per year by 2025, outpacing the $11.5 billion Nevada gambling market but still well behind the highly saturated $33 billion Macau market. Okada, the entrepreneur who built Universal Entertainment from scratch 50 years ago, starting with pachinko machines before moving into arcade games, slot machines and a range of gaming products, is clearly a natural forerunner for one of the coveted integrated casino resort licenses and has told the Asia Times, he has every intention of getting back in the game. The 76-year-old Okada’s fall from grace after decades of work accelerated last June, when Universal Entertainment President Jun Fujimoto formed an alliance with Okada’s children and other Universal executives to oust him as chairman of the board of his own company amid a series of allegations of financial misconduct. Okada had created Hong Kong based Okada Holdings Ltd. as a way to pass on his wealth to his two children, daughter Hiromi and son Tomohiro, and avoid the excessive estate tax in Japan. Okada held 46% of the holding, with his son controlling 43% and his daughter in the king maker position with a decisive 10% of the company’s shares. Hiromi has told the Asia Times that she was forced to sign a series of papers under duress, that she was told there was no time to consult her father or to get the papers translated from English into her native language Japanese. She had no idea that these papers would be used to oust Okada as the sole director from Okada Holdings and place in his stead two new directors working in close concert with executives at Universal, who had also co-opted his son. Okada Holdings holds 67.9% of Universal Entertainment, which is listed on the Tokyo stock exchange. Okada would only learn of the plot to oust him several days later, in May 2017. In the run up to the coup Okada said he had committed himself completely to the Manila casino that bears his name. The Okada Manila casino had first seen a soft opening in 2016, which had to happen in order to meet the requirements to PAGCOR, the Philippines regulator. Okada, however, wasn’t particularly worried at the time. He showed up for the Universal Entertainment board meeting in May with a plan to retake control of Okada Holdings. The Okada Manila has only completed a small number of the total guest rooms allowed for in the license. A total of 1,000 guest rooms had been planned but due to the small number of rooms completed to date, the casino could only operate an equivalent fraction of the 3,000 slot machines and 500 gaming tables intended for full operation. 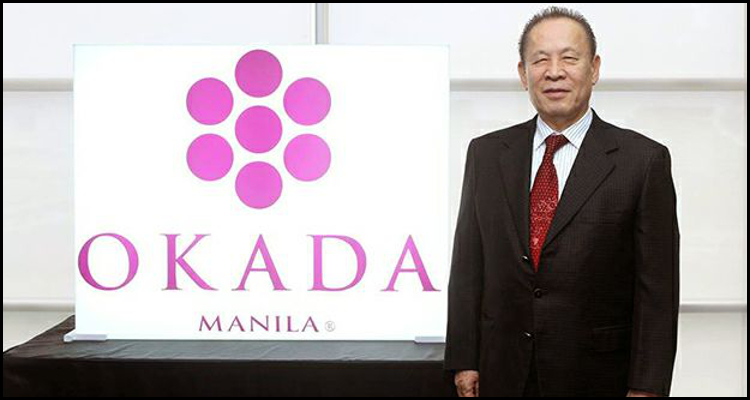 Competition in the Philippines market is fierce, and the Okada Manila had to get up to full operational capacity to compete with the likes of Andrew Tan at Resort’s World Manila, Henry Sy and Lawrence Ho at City of Dreams Manila, Genting’s Lim Kok Thay and Solaire’s Enrique Razon, all casino billionaires like Okada. The plan was to introduce a new issue of shares to fund the completion of the Okada Manila, which he would purchase himself, only to insert them into Okada Holdings in his name to regain majority control of Okada Holdings. In the past, Okada had come back from behind before. Back in 2000, MGM bought Las Vegas based Mirage Resorts and immediately proceeded to push out its founder Steve Wynn. Okada stepped in and put up approximately $455 million, half of the capitol needed to fund the new Wynn Resorts, where he would go on to work as an executive. The new Wynn Resorts would construct the Wynn casino on the Las Vegas Strip as well as win one of the first casino licenses in Macau, rocketing Steven Wynn to the upper echelons of the global casino industry. Wynn, however, would not fare well, forced to resign from his own company at the beginning of 2018 amid mounting allegations of sexual harassment. When Okada stood to raise his proposal to issue new shares at the May 23rd board meeting, a cabal of directors declared his proposal “out of order”, then proceeded to present the preliminary report of an audit that alleged to show financial impropriety on the part of Okada. “Unknown to me beforehand, he started laying out allegations of wrongdoing, accusations I had no knowledge of and no involvement in,” Okada told the Asia Times through a translator. In turn and indignant Okada lectured the board in a raised voice demanding to know what right the board had to judge him as founder and chairman of the board over unsubstantiated allegations. The outburst led to Universal President Fujimoto immediately suspending Okada’s powers. In a huff, bewildered and flabbergasted, Okada stormed out of the room and was subsequently banned from entering his own casino, the Okada Manila as well as the Tokyo offices of Universal Entertainment. The auditors later full report to the board would allege Okada manipulated company funds for personal gain on three occasions, costing the company some $20 million in damages, an allegation Okada says is patently untrue and “an absolute sham”. In the interview with the Asia Times, Okada vociferously refuted the allegations, asserting enemies within his own company had pushed through the transactions to frame him and offering up a 3,000 word document detailing the plot. So far, Okada has filed two lawsuits in Hong Kong aiming to regain control over Okada Holdings and his daughter Hiromi has also filed two lawsuits aimed at negating the documents she unwittingly signed that led to his ouster. Universal has also hit back, filing suits in Japan and the Philippines to keep Okada out of his own company as well as taking aim at Aruze Gaming America, formerly a part of Universal but 100% owned by Okada since 2009. Universal filed suit in the U.S. against Aruze Gaming America in April this year claiming patent infringement in a move clearly designed to keep Okada on his back foot. At the same time, Universal filed a complaint with the Independent Commission Against Corruption (ICAC) in Hong Kong and even issued a press release asserting Okada had been “arrested” after the commission was forced to call him in for questioning as a matter of procedure. Okada, however is still fighting and has stated he has every intention of regaining control of his casino empire. Were the Hong Kong suit to succeed, Okada expects to step back into the driver’s seat at Okada Holdings as well as regain control of Universal and Okada Manila. A Japan integrated casino resort license may still well be in his future.